A large crowd of Cowley College donors heard heartwarming stories from current and future students during the annual Cowley College Foundation banquet held Thursday in the Earle N. Wright Community Room. The event had generous support from CPA Solutions L.L.C., and The Trust Company of Kansas who have served as sponsors for the event for a number of years. Cowley College vice president of institutional advancement Ben Schears served as emcee for the evening and thanked those in attendance for their support. “What you do for us through the foundation changes lives, and the lives you change can change generations” Schears said. Great Western Dining provided a wonderful dinner. While, Cowley College’s Theatre Department performed “You’re a Good Man, Charlie Brown” in the Robert Brown Theatre following the banquet. During the banquet, Cowley County Sheriff’s Department Lt. Christina McDonald was announced as this year’s recipient of the Young Achiever Award. The award recognizes individuals age 40 or younger that have had success in their educational achievements, careers and community service, and/or service to Cowley College. “It’s important to honor law enforcement officers, and particularly ones who are outstanding alumni of ours, for their successes” Schears said. 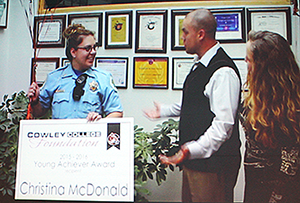 Along with serving the community as a Lt. in the Cowley County Sheriff’s Department, McDonald is involved in the Big Brothers and Big Sisters organization and previously received the Arkansas City Optimist Club Officer of the Year Award. 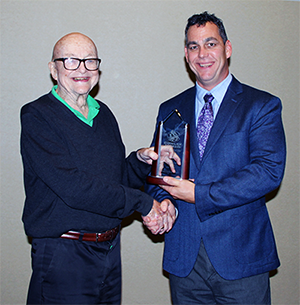 The Ambassador Award was presented to Ed Gilliland. The award recognizes individuals who have provided sustained volunteer or other service, or through philanthropic work to Cowley College. Mr. Gilliland was a member of Cowley College’s first Board of Trustees and was also the first president of the Cowley College Endowment Association (now Cowley College Foundation). He has been a long standing civic leader and owned Gilliland Printing, Inc. in Arkansas City for many years. “So many people have been involved in this, thank you all for everything,” Mr. Gilliland said. 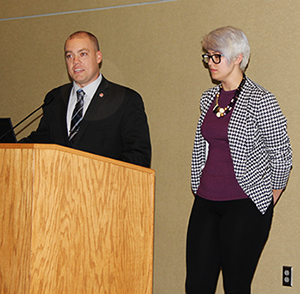 Donors in attendance also heard from current Cowley student Ashley Daniels, who could not afford to live in the dorms, had spent time as a homeless student, and used to have to drive from Derby to Arkansas City three times a week for classes. However, thanks to an anonymous donor, Daniels now lives on campus. Schears then capped off the night by surprising Crystal Williams, a senior at Winfield High School, with a full scholarship from Larry and Carlla Pike, owners of L.G. Pike Construction Company Inc. of Arkansas City. The gift from the Pike’s will allow Williams to live on campus and attend full-time and not have to worry about covering the cost of attending her first two years of college. 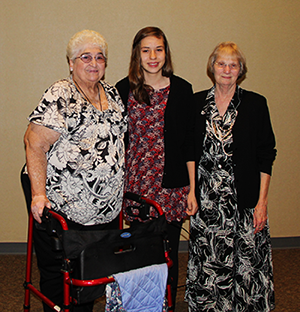 Schears thanked Cowley employees Elizabeth Thummel, Lisa Grose, and Liz Shepard for their help coordinating the annual Endowment Banquet. “This is one of our best nights of the year and none of what we do would be possible without the tremendous support we receive from our donors.” Schears said. “They make all the difference in the lives of many of our students”. To donate to the Cowley College Endowment Association, contact Elizabeth Thummel at 620-441-5319 or Ben Schears at 620-441-5245.